About a year ago, I decided to basically have one single focus when training with Quling: to get a better cooperation. The time before this decision had been a long and frustrating period where I did not understand my dog and I could not get through to him. He seemed to have two extreme modes: 200% on or completely off. Our first year together was lined with disasters. A family member died and besides this I had two overwhelming personal dealings. In other word, it was a tough year for me. But it was also a tough year for Quling. He moved in with us at the age of 15 weeks and we discovered he had worms. During a six month period we had to deworm him way too many times and his stomach crashed. Meanwhile, in extreme stress for the both of us, we were supposed to build a foundation of trust and confidence for future training. It sort of went down the drain. Besides this Quling also has a very soft personality, and I think he might be extra sensitive since he got to a bad start in the life with me. If he feels the slightest pressure from me or the environment, he literally shuts down. He just lay on the ground and does not want to do anything at all. It has been, to say the least, very challenging. 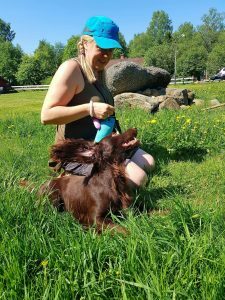 Even though I only train with positive reinforcement and avoid physical or verbal corrections – he behaves like I have abused him … In combination with Quling’s soft side, he’s a proper hunting machine. He jumps the fence of our garden and hunt by himself in the field like crazy if he gets the chance. He has been black or white and I want different scales of grey since I find it easier to train such a dog. Last autumn I put all field training on hold and decided to do just things that strengthened our cooperation and relationship. In general, I think all positive reinforcement strengthens relationships, but Quling thought a lot was scary and very unpleasant. If I had a friend with me when training or someone just watching us, Quling could leave. He had two ways to solve this pressure, either to just lay down, preferably hidden under a bush or likely, wagging his tail low, or just run off in 100 km/h. Last winter, I finally found the right treatment for his stomach and from that day on everything has been easier. Another thing that helped has been agility training. From the beginning, he did not play, did not want treats,was afraid of the tunnels and avoided the obstacles. He was mostly keen to use his nose and discover the area. NOW he can play tug, he happily eats his new diet food (which is good for his stomach) and he even takes it as a reward. He gets self-rewarded to run through the tunnels at the agility, he jumps the obstacles and we have a lot of fun. It was like all the pressures where released when we started with agility. I just wanted us to have fun, none (or very little) achievement was involved. Since agility really builds on cooperation – things have improved so much for the better. Quling´s only intention these days when it comes to agility is to be with me and work with me. It feels amazing! A few months ago, we started to do some hunting training again. 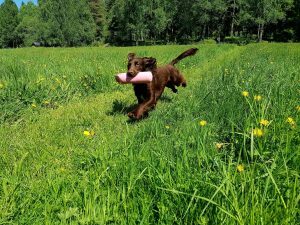 Cautiously, I have exposed him to training in groups and sometimes he thought it was really tough – especially if the others in the group bawl at their dogs. 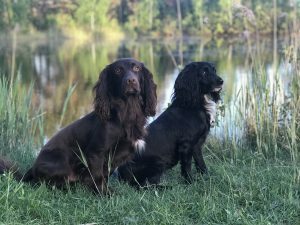 But with our new collaboration and with my focus on building trust and relationship in everyday life, he has sought me for support – although there may still be some “I just have to run away for a while” when training in groups. 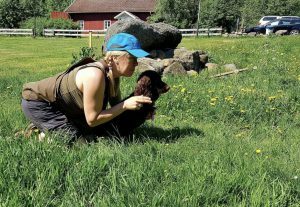 A while ago, I was training with some friends and acquaintances at Sjöön, a magical training place for gun dogs. My only focus for Quling was that he would just DARE, that his confidence would grow even more and that he would work with me. Since Tassla was with us I could swap dogs often, which meant that Quling got many breaks between training challenges. I tried to mix difficult tasks with easy well-known ones. I specifically trained Quling to dare to run back to me at full speed despite other people being around me and that he should dare to run past people to pick up a dummy. I let him play a lot in situations he finds scary, close to the playful and obedient dogs I trained with. When passing the scary shooter and the thrower to pick up the dummy or likely he received a lot of rewards. On a few occasions, he showed small tendencies to give up and leave but the difference now is that we can work together and get through it. Here we work with Quling running out and past shooters and throwers without making a “banana swing” into the woods to avoid passing them close. We made four repetitions and the first was unfortunately not filmed, but he hardly dared to pass the shooter and thrower and he took a wide turn inside the forest to pass them. There is not really any speed in these repetition, but it’s at the end of the day, it’s 25 degrees and some uncertainty on top. I know that Quling is very fast, so it does not worry me – he will perform with speed eventually. We also did some casting, memory retrieves, and took turns casting three dogs to an area containing nine dummies. They were sent to retrieve three dummies each. I did both right-handed cast, push backs and regular straight lines. Quling proved that he can 1, stay in the area where the dummies are and not drift off to do something else and 2, take first found dummy and 3, not swap it with another dummy. He did it very well. 🙂 I saw one dummy swap during the whole weekend. 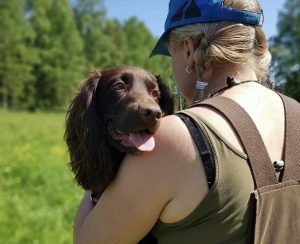 He is amazing and safe on straight lines and retrieves at high speed (when he is confident and not uncertain) I am very pleased with that. Unfortunately, nothing of this got caught on film, just one of the first memory retrieves. I think the best moment was when a friend, who had not seen Quling work for six months, said – “you cannot even compare how he was in the fall, back then he was only black or white, now he has nuances. And another large difference is that he now wants to be with you. Tthis could perhaps be something that is hard to hear but for me it was only a very nice confirmation: We are on the right track!